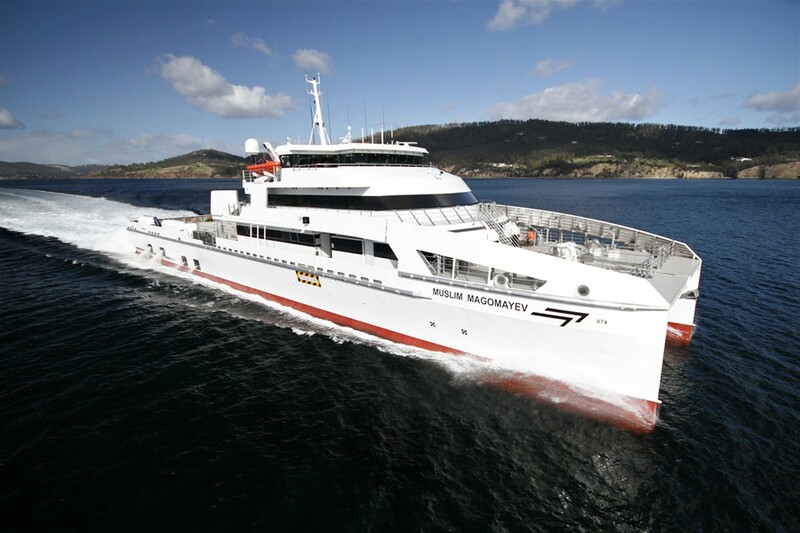 The 70 metre, 30 knot semi-swath catamaran incorporates a crew transfer system consisting of dynamic positioning equipment coupled with a stabilised access platform, effectively a walk-to-work system. The vessel, the largest catamaran fast crew boat to operate in the global oil and gas industry, transports 150 workers to multiple offshore installations in lieu of helicopter transfers. The boat offers fast transits in sea conditions of 40 knot wind and seas of 3m SWH, with over 100 sq. metres of cargo deck for cargo hot shots of 110 tonnes of specialised equipment over 300nm at speeds up to 35 knots. With the resiliently mounted superstructure being easily modified to be as short or long as the client application and hull length requires, this has allowed the development of numerous concepts that have taken advantage of this inherent flexibility of design. This design feature together with the inherent stability of the catamaran platform makes a work vessel concept extremely adaptable. With a large and relatively stable working deck, bridge and hull layouts that allow for class notations necessary for operating close into offshore structures while transferring personnel or equipment, the operator has enormous flexibility in application. The decks can be configured for containerised deck cargo, carriage of bulk cargoes for transfer to platforms or when equipped with the necessary equipment, crew transfer. The large deck area also allows for dual roles such as personnel or equipment transfer, but also be able to carry search and rescue equipment as well making these vessels adaptable and versatile for an operator. When equipped with dynamic positioning and offshore supply vessel capability, the vessel can hold station and/or loiter at slow speed if the application calls for the vessel being fitted with a moon pool or aft or side deck winching.